I agree with your comments on Eddington's wonder. I am interested to buy this book authored by your grandfather. 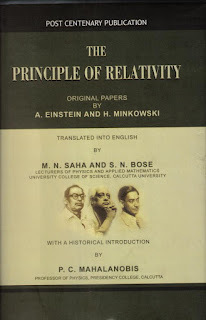 It was (till few years ago) not available in the book shops in Kolkata. Do you happen to know where it is available? I have heard about this masterpiece but did not have the priviledge to read or own it. You might be interested in contacting Maurice diGiuseppe at UOIT in Ontario - he is one of the leads in the new chem txtbk Nelson is publishing. If they mention Bose-Einstein condensate as a state of matter, they should put in something about Bose - about time the school txtbk changed methinks. Josh. PS fab resource site for my own teaching. Good dispatch and this post helped me alot in my college assignement. Thanks you for your information. My page: lg blog. Is it realizable to exchange element with you? Its my great pleasure to visit your site and to enjoy your great topics, I like it a lot. I see that you paid much attention for those topics, as all of them make sense and are very useful. Great post, thanks. I really like it. Somebody essentially help to make severely posts I might state. This is the very first time I frequented your website page and thus far? I amazed with the analysis you made to make this actual post incredible. Fantastic activity! Excellent website. Lots of useful info here. I am sending it to a few buddies ans additionally sharing in delicious. And of course, thanks in your sweat! hello!,I really like your writing very so much! percentage we keep up a correspondence extra about your article on AOL? I require an expert in this area to resolve my problem. Maybe that is you! Having a look ahead to peer you.